An iconic sculpture that has been at West Edmonton Mall for ages. More than four decades ago, Canadian sculptor Robin Bell arrived in Italy. He decided to make it his home, as he perfected his realist sculpture in the country that redefined realist sculpture. Even though Bell settled abroad, he received commissions from across Canada, and his most massive project can be found at West Edmonton Mall. 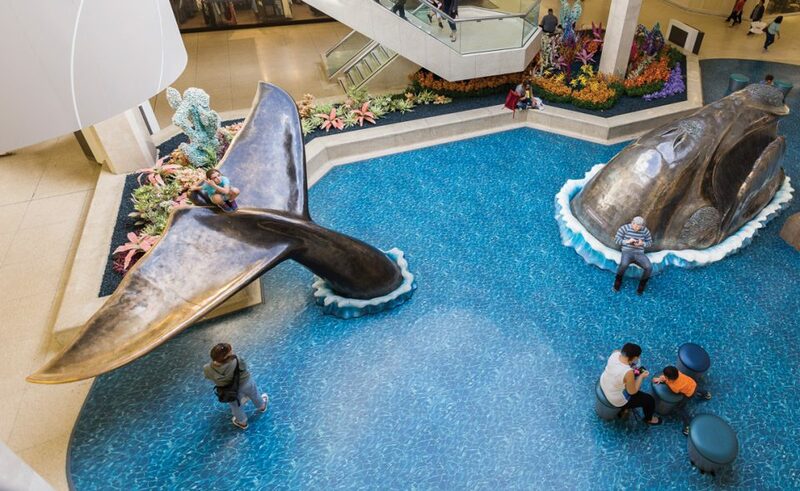 It’s called “Open Sea,” but to most mall-goers, it’s the really big whale. It’s two sculptures; a giant whale’s head, with its mouth open. You can walk in and sit down inside; there’s an eerie blue light at the end of the inner chamber. On the outside, the bronze is covered in barnacles. A giant eye can be found on each side. The second part is the tail, looking like it’s about to smack down into the sea. Kids currently use this as a big slide, or at least they were when I recently looked at the piece. Bell’s sculpture was revealed in 1985, after 19 months of work. Until 2010, the two-piece “Open Sea” was all wet. That is, it was located in an indoor pool. This made a lot of sense, because the statue is a whale. But, it was removed and placed in storage for five years. Was the whale harpooned for good? No. In 2015, it was re-mounted in Phase I, right in front of the Sears entrance. Now, the pieces emerge out of a blue floor, with sculpted “waves” that simulate water. This whale has been beached, and the effect isn’t as impressive as it used to be. Just as Captain Ahab was obsessed with his whale, Bell went to great lengths to, ahem, “capture” his sea creature. He travelled to the University of Pisa, which had a complete right whale skeleton. He used that skeleton as a reference for his sculpture, to ensure the whale was as life-like as possible. “I selected the right whale because it is found on both Canadian coasts and is the most endangered of the whale species,” Bell says in his artist statement. Bell cornered the market on Edmonton shopping-mall sculptures in the 1980s and 1990s. Before “Open Sea” was unveiled, he sculpted “Running In” for West Edmonton Mall – it was a representation of three roughnecks working on a rig. That piece can be found just outside of Galaxyland. Not to be outdone, Millwoods Town Centre commissioned “Chunky Cutting,” an intricate sculpture of a cowboy on a horse, that was completed in 1990. Then, in 1998, Bell finished “The Cutters’ Choice” for the mall. That was a life-size calf posed right across from the horse and rider, creating a fully realized life-on-the-range series.